Virginia’s wine trails will lead you straight to the state’s excellent wine bars. Rising in popularity, people across the state flock to these spots—serving up world-class wine options, educating patrons, and providing the perfect place to unwind after a long week. Here are the 10 best wine bars in the state. The Wine Kitchen restaurant and wine bar has three locations, one in Leesburg, Frederick, and Purcellville, Virginia. Each location’s menu differs slightly, but the values of good, clean, delicious food and drink make for a consistently fantastic experience at any of the three locations. The Wine Kitchen is a wine bar-restaurant, featuring a full menu as well as beer and wine list and catering options. With the central tenant of “Eat, Drink, Simply” at the heart of all they do, The Wine Kitchen excels at artful eatery. The Tasting Room in the Reston, Virginia Town Center is a wine bar and shop featuring wine from the Boxwood Estate Winery. The menu features wine from all over the world as well as a small food menu, including mixed nuts, cheeses, salads, and panini. The Tasting Room host’s events almost every day, ranging from live music to happy hours and more. Middleburg is wine country. Known as one of the best wine regions across the United States, the Salamander Resort Gold Cup Wine Bar celebrates that fact. Each month, Gold Cup features wine from a different local winery as part of their complimentary “Winery of the Month” promotion. The resort caters to the more affluent and has a spa onsite, equestrian offerings, as well as various other activities and the winery. Make a weekend out of the Salamander Resort and spend the afternoons enjoying small plates and wine at the bar. 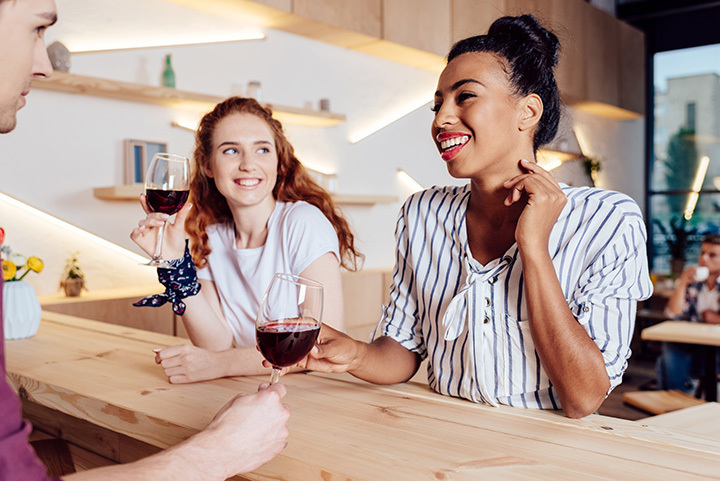 The Screwtop Wine and Cheese bar in Arlington, Virginia is one of The Washingtonian’s “Great Bars of 2013,” as well as Arlington Magazine’s “Best Girls Night Out.” The wine list is updated weekly with new bottles from different regions. The menu is cheese centric, and usually is paired with a specific wine (but not always). The wine and cheese club is a particularly popular attraction. The Vinifera Bistro in Reston, Virginia, has monthly specials on wine and has live music every Friday and Saturday. Vinifera is named for the most popular wine species used today. The Bistro is known for its over 300 wines and Mediterranean cuisine, supplied by local farms. Cheeses, fresh produce, and fish are also on the menu. Secco Wine Bar in Richmond, Virginia, is one of the capital’s most beloved wine bars. “At Secco, we believe that drinking the good stuff is a natural right, so we proudly serve a wide array of small-production, terroir-driven Old World wines.” In addition, house cocktails, teas, coffees, and a seasonal menu round out the experience. Secco aims to be a European-style eatery with a “casual-chic vibe.” When you want a taste of Europe without a transcontinental flight, Secco is the place to go. The Sonoma Wine Bar and Bistro in Virginia Beach Town Center has over 325 different varieties of wine and 70 by-the-glass. Sonoma is open for lunch and dinner. The food “offers a health-conscious signature blend of eclectic American foods prepared with a European bistro flair.” Add to that the eclectic varieties of wines from small vineyards from around the globe, and you’re in for a unique experience in the heart of the Beach. Parallel Wine and Whiskey Bar is a Broadlands, Virginia staple. Voted “Best Wine Bar” for five years in a row by Northern Virginia Magazine, their 80-plus bottles of wine, 100-plus craft beer selections, and over 170 bourbons and whiskies has made fans of almost everyone that stops by. Their cheese and meat plates are delicious, with offerings from all over the world. Don’t skimp on the sharking plates, either, or the dessert. With regular Crazy and Happy Hours, live acoustic music, and weekday events, there’s always a good reason to stop by Parallel. Bottle Stop Wine Bar in Occoquan, Virginia, is the area’s premier wine bar, offering pizzas, sliders, cheese platters, and entrees along with their wine, craft beers, whiskeys, and spirits. Their wines come from all over the world but won’t price out most visitors. The vibe is casual. Bottle Stop is a good place to take the family and enjoy a nice glass of a new-to-you wine. The Fat Canary wine and cheese shop in colonial Williamsburg topped BuzzFeed’s national wine bar list, and for good reason: it has received the AAA Four Diamond award each year since opening almost fifteen years ago. The refined restaurant serves upscale fare, including American food and cheese, as well as fine wines and cocktails. For a taste of the old world while visiting historic Williamsburg, the only choice is Fat Canary.